Open form 7:00 a.m. to 4:00 p.m. 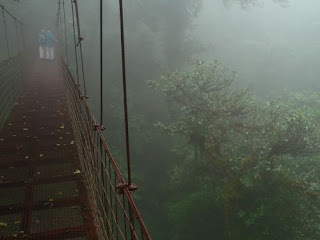 The Monteverde Cloud Forest Bilogical Preserve is one of the most famous cloud forest reserve in the world and one of the most important pretected areas in Costa Rica, chosen as one of the seven wonders of Costa Rica. The surprising biodiversity found at Monteverde Reserve is a result of the geographic, topographic and climatic conditions there. Its forests contain four ecological "Life Zones". 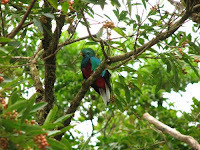 This gives rise to differing ecosystems inhabited by hundreds of species of mammals, birds, butterflies, amphibians, reptiles, insects and spiders, as well as a diversity of mosses, epiphytes, vines and other plants and trees typical of cloud forests. 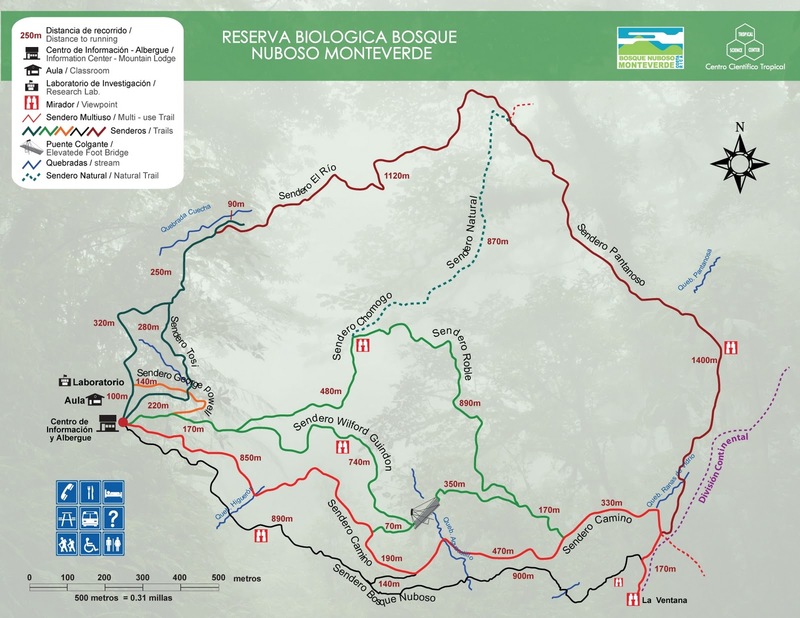 Trails Map of Monteverde Cloud Forest Reserve. The preserve is open to the public daily from 7:00 a.m. to 4:00 p.m.
9 differents natural paths stetch for 13 km through the Preserve. 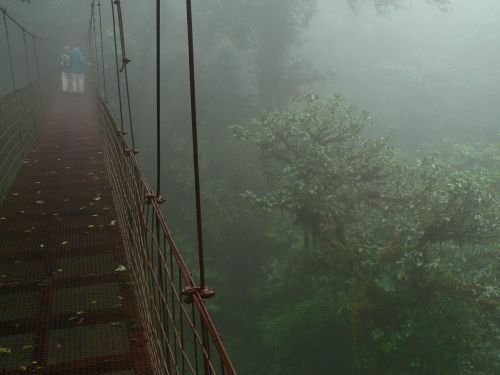 A hanging bridge extends over 325 feet, at a height of 80-100 feet above the foret ground level, offering a close view of hundreds of epiphytes. There two shelters within the Preserve open to public use. Mountain lodge with capacity for 47 persons. 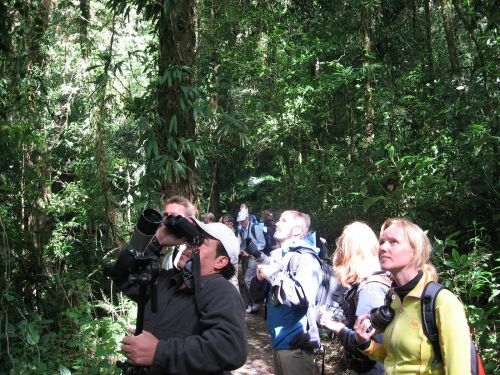 Nature Walks led by highly-qualified guides. 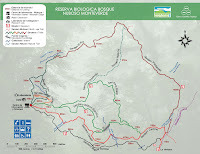 Hours: 7:30, 12:00 and 1:30 p.m.
Night Guided Walk at 6:15 p.m. The Monteverde Cloud Forest Reserve was established in 1972, when in the face of the growing threat of settlers moving up the mountain, visiting scientist George Powell and his wife joined efforts with one of the first quakers to arrive to Monteverde, Wilford Guindon, to promote the establishment of a natural reserve.